The Legend of Ba Qing <巴清传> may not even get airtime at all despite securing the country’s limited quota on broadcasting historical dramas. On March 29, Chinese actor Gao Yunxiang (高云翔), also known as Gavin Gao, was arrested in Sydney for sexual assault. Gavin is the male lead in The Legend of Ba Qing, starring alongside Fan Bingbing (范冰冰) and Yan Yikuan (严屹宽). According to a news report, Zhejiang Tangde, the production company behind Ba Qing, lost over 800 million yuan in the market a day after Gao’s sexual assault was reported. Fan Bingbing, the ninth biggest shareholder of Zhejiang Tangde and producer of Ba Qing, also suffered a huge financial blow. In addition to losing 800 million yuan, Zhejiang Tangde is required to reimburse broadcasters for breaking their contracts. 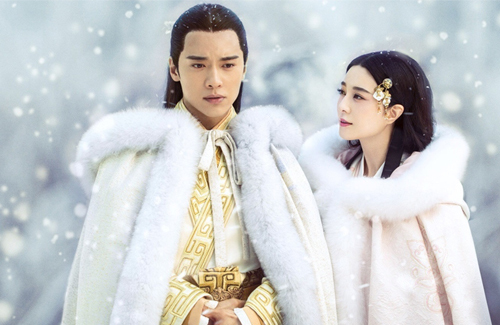 Online broadcasters initially paid the studio 8 million yuan per episode, totaling 480 million yuan for 60 episodes, for the drama to air on their platforms. In addition, satellite broadcasters like Jiangsu TV and Dragon TV already paid the studios a total of 230 million yuan each. With all of these numbers combined, the amount that Zhejiang Tangde has to reimburse is astronomical. Dang that’s a lot of money, but I don’t think this is going to be barred from airing. Maybe postponed for a while, but it will air eventually. @coralie they will still need to wait for court procedures for the all clear, and that would drag out for years! By that time, fame of Gavin and fan bing bing might change, and the cost of this drama might reduce sustainably. I do feel bad for her production company though. I think her fan base is large enough that the pressure might give the gov’t some motivation to overrule the ban. but we’ll see. I did not know there is such a rule that actors have to be free of scandals etc. Ridiculous rule and can be easily misused. No wonder paparazi and competitors try to cook up stories to defame actors. No wonder weibo top stories are all about marital affairs and who is cheating who. It is not fair to penalise the drama because there is an allegation againsr the actors. That said, I am not advocating actors to commit crimes. It is not realistic for the legislators to expect perfection when I doubt the legislators themselves are perfect if their lives are put under the microscopes. Maybe all budding actors should go through a monk course. Lol. @mangotango problem is with Hollywood is that you have an actor did something bad, immediately release a hot movie, all is forgiven! He’s even more famous than before the scandal! Look at Brad Pitt and Jolie! Those two gloat about their cheating and their movie is a hit, and so everyone is ok with them! So I’m not totally for it, but I can get the reason why they do it. I think it should be postponed but not bar maybe. @littlefish Yeah in the western audience do not care about personal lives. It is the acting and story that counts. Elizabeth Taylor was married many times and no dent to her fame. Lol. In terms of the series —I don’t think there are legal ramifications though (meaning they aren’t restricted from airing due to court case), as this sounds like more of a censorship thing than anything else so technically there are still ways around it. I guess one thing the production company can do to minimize the financial damage is cut all of Gavin’s scenes – of course, if he’s the lead (and assuming he has a lot of scenes), that would make the drama be completely incoherent, but at least they would still be able to air it and recoup some of the costs. Remember that’s what they did a few years back with Kai Ko when he was involved in that drug scandal prior to his movie airing – the production team for the movie cut out all his scenes and still was able to release the movie in China (though quality wise of course it suffered but at least they were still able to get the movie out there and make some of the money back). @llwy12 based on the poster, my impression is he’s one of the 2 main male leads >_> I don’t feel like Yuan Kuan a male lead at all, if it’s not for the bill listed him as main lead. sooooo cutting him out isn’t an option lol. it’s really silly to bar a show from broadcasting b/c of the casts moral issues…. i read online how this whole thing about the sexual assault was cooked up so that the drama would be in broadcast hell. i am now starting to think that it’s not totally impossible. one can so easily plot something if they want to bring a strong competitor down. i read that the soonest gavin could go back to china is at a minimum 1.5 year if he is found not found guilty but if he is, he would be facing 20 years in Australia jail…. i hope the rumors about this being a plot isn’t true b/c if it is, whoever that plotted this deserves to be in hell. @m0m0 lol, put it this way, if Gavin isn’t prone to it, no one can get him into that hotel room. Unless he’s drugged, tie up and dragged there, which should all have physical evidences to help him proof his innocence. The thing about conspiracy theories is a lot of time, it’s just people making it up to fix the problem. Who to say those people are not ppl who works for Fan Bing Bing’s production company? Especially when they are faced with so many compensations. well, being prone to is different than being set up. everyone’s prone to something but actually taking advantage of that vulnerability by doing something immoral for a gain, don’t think any excuse is enough to justify the act. @m0m0 it’s true what you said, but most likely than not, the actor did this to himself rather than being set up. I don’t think he’s that important nor the series is that great to get this type of set up. Also getting it done in China is easier than in a Australia as I think Chinese will be easier to cover up the conspirators, but in Australia? What might have happened is they got her to do stuffs, and she’s later regretted it, and felt like she was being forced into it. @m0m0 Let say that he was being set up by the competitor. Then whom do you think set him up ? This is honest question. I am really curious since I don’t know who is Legend Ba Qing competitor since Ruyi cannot be broadcasted.